When it rains it pours! On top of a book launch, taxes due, and project deadlines, I’ve added some major website technical issues to the list. Pardon the mess around here! Because of this, I’m a little late in posting for this blog tour, but if you don’t tell then I won’t either. Illustration friend and SCBWI mentee Christina Forshay recently tagged me for participation in a global blog tour called The Next Big Thing. The idea originated in Australia and is basically a cool way for authors and/or illustrators to promote their next or latest book. Miss Maple’s Seeds, just out April 4, 2013 from Nancy Paulsen/Penguin Books. The book merges a couple inspirations: a) when I was younger I was obsessed with drawing tiny people living in trees. b) my grandmas and mom all have green thumbs, and though I don’t have the ability to garden now, I would love to follow in their footsteps and become a gardener one day c) I was inspired for my character when I first saw fellow illustrator Diane Browning, and drew a little sketch in my notebook of “the acorn woman”, who eventually became Miss Maple. I would love to see this animated with claymation, and hmm, who would be the voice of Miss Maple? I can’t think of many older actresses at the moment, but someone with a warm crackly voice would be perfect. A tiny woman collects and cares for orphan seeds, and teaches them all they need to know before sending them out into the wide world. The lovely and intelligent Nancy Paulsen of Penguin Books! I wrote a first solid draft in under a week. I keep wondering if that will ever happen again! The story balances a fun, fictional story with a little bit of education about seeds (types of seeds, what they need to grow, how they travel) hidden inside. 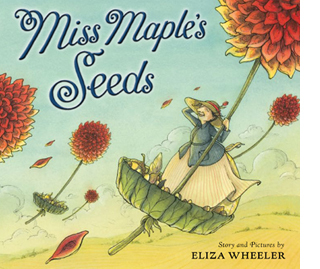 Kids love these little micro worlds; parents and teachers will relate to Miss Maple as a caretaker who has to eventually let her seeds set out on their own into the world. Thank you, Christina Forshay, for incuding me in this fun blog tour! I pass the torch on to a literary sibling (we share an agent), a talented and super nice guy, Mike Boldt! Mike has a hilarious new book coming out this year called “123 Verses ABC”. Look for his post next week. 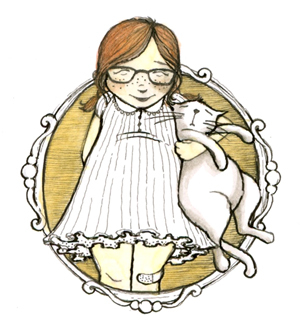 Miss Maple Fan Art by Mary Lundquist!